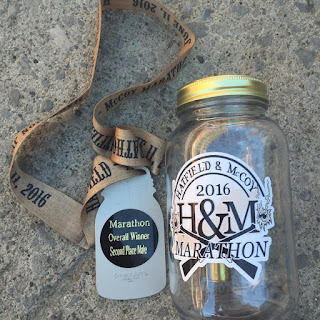 BrooklandRunner: Hatfield McCoy Marathon Recap - 2nd Male/3rd Overall! Hatfield McCoy Marathon Recap - 2nd Male/3rd Overall! If you told me I would run a 3:27:30 marathon today, I would have reacted by feeling that I had a bad day. Yet, due to a challenging course on a hot day, my 3:27:30 was apparently good for third place overall and second male. Second Male Award - Finishers get the mason jar. The Hatfield descendent gave me the bullet casing for coming in second. I ran a fun course that is well-supported by the community through a scenic and historic route. It runs past many of the sites of the Hatfield and McCoy Feud and was listed by the Weather Channel as one of the 15 toughest marathons and Runner's World as one of the 10 bucket list marathons. I was supposed to travel with a friend, but he injured himself after the Boston Marathon. Despite my best efforts to find a travel companion, I ended up going solo. I left Friday morning from National Airport where I rented a car. From there, I hopped on I-66 and traveled through Virginia then West Virginia. I only stopped once where I refueled and went to the bathroom. The drive was scenic. At the hotel in Logan, West Virginia, I rested before driving another thirty miles to the packet pick-up at Belfry High School in South Williamson, Kentucky. There, I chatted with other runners at the pasta dinner, watched the Hatfield-McCoy skit, and enjoyed the atmosphere. At the pasta dinner with descendants of the Hatfield and McCoy families. In the morning, I arose, ate, got ready, and checked out of the hotel. The drive to the start was in the pitch-black with few cars out. I found parking near the start and chatted with a guy from Boston named Spence. We would end up running together for the first ten miles or so. I hung out with him at Food City in the parking lot wondering where the start of the race was since no one saw any indication of where we'd line up - turns out it was a simple line painted in blue on the road. The race begins in Williamson travels up through Hardy, over a mountain, down through Buskirk, through Matewan, up towards the golf course at Sprigg and all the way up Aflex to end along the main road of downtown Williamson. At the start, many of us toed the line. A guy named Justin (standing to my left) asked me what my expected race finish was for the day. I said 3:10, but who knows given the heat. He asked a guy next to him (in the blue on his left) who replied 2:30 and then proceeded to sprint out in front. After quarter of a mile, he stopped. It looked like he just wanted to lead the race for a bit then wait for friends. Spence lined up next to Jessica (on my right). At 7:00 AM promptly, the race took off and Justin and another guy lead for the first 1.5 miles. But, the police led them the wrong way. We were running with Jessica who had run before so she knew to take a turn. I suspected the leaders would catch up, but I never saw them again and no one knows what happened to them. I even checked the results for his bib, but found nothing. I wonder what happened and how he must have felt. The start of the race. No fancy timer mats: simply a blue line on the ground with the word "Start." We had a decent crowd in the first few miles. I remember running side-by-side with Andy for a few miles and some other folks who were doing the half. The first big challenge was the hill around miles 6-7. We all took it slow and joked that someone should treat it like a hill workout. At the top, I caught my breath and started to let myself go fast down the hill to catch Andy again. But, a side stitch on my right slowed me down and prevented me from going under 7:20 again. At some point, Megan, the female winner, caught us and ran with us. Little did I know she would beat Andy by two seconds - and who would have thought 3:13 would be the winner today? By the half, I was mostly running by myself. Spence had dropped back and there wasn't anyone within my sight. The half was through the center of a small town. I remember raising my arms in jest as I passed the finish line for the first half. After the circle through town, it was back onto a lonely path hoping I was on the right course. Jay, who is probably the only other Jew, and I met at dinner. I joked that we should do Mincha/Mariv after dinner. With Raj, we sat and watched the skit. He passed me early in the race, and I didn't recognize him when I passed him later in the race, right before the golf course. I also caught another runner who went straight instead of over the swinging bridge of the golf course. I only went the right way since I saw a photographer on the other side of the swinging bridge with some volunteers - and I remembered someone mentioning something about a swinging bridge. It certainly was not steady running over. When I landed back on solid ground I told them that they needed to have someone stand on the other side to direct runners. Apparently a sign fell down. There were times when I actually wondered if I was on the right course. Seeing signs cheering on runners (they make them for return runners), water and aid stations, and occasional blue paint on the ground reassured me that I was on the right route. The last 10K was brutal. It was hot and there was one last long climb around mile 23. I remember when I saw the hill I shouted out an expletive that surprised the volunteers handing out water. At that point, the people I caught were second half finishers, many of them walkers and many in groups. One woman told me that I was third, but I didn't believe her. I assumed she miscounted because the last time I checked, there were a number of people ahead of me. A mile later, another woman walking with her group told me I was third. That's when I got competitive and realized that maybe she was right. I felt footsteps and looked over my shoulder occasionally, but I never saw anyone threatening. I hoped I could catch one more person to rise in rank. I repeated, "I didn't come this far just to come this far," and kept my legs moving. It was especially hot and my legs were done, but I kept going by sheer spirit. The final mile was not a fast finish like I aim for but a sustained shuffle of keeping my pace and counting down to the end. When you cross the finish, you get a high five from these guys! I went back to display my second place award. Overall, I enjoyed the race. It was the best 3:27:30 I have ever run. Who knew it was good for the podium? The lesson? Never give up. Just keep shuffling along as you never know how everyone else is doing. After the race, I stuck around for a bit, changed, and hopped in my rental car to return to DC. I made it in time for a celebratory dinner with the wife and dog at Brookland Pint. Another good time and happy with my effort. My plan is to try to take a break from hard running for a month before training for Marine Corps in the fall. The results have been posted. The local news did a story and you can catch me at the start a few seconds into the video. Finish line photo with DC Road Runner Club VP of Races, Raj!